PITTSBURGH (AP) — Antonio Brown insists he’s still in sync with Ben Roethlisberger even though their numbers together are down. They’ll seek consistency entering the Steelers‘ home game Sunday against the Atlanta Falcons. Brown eclipsed 1,500 yards receiving three of the last four years and is the only player in NFL history to have five straight seasons with at least 100 receptions. Last season, the four-time All-Pro averaged 15.2 yards per catch on 101 receptions and he led the league with 1,533 yards, but his statistics are down this year. Brown’s 53 targets are second-most in the league, but he has just 29 receptions for 272 yards receiving and a 9.4-yard per catch average, well below his 13.4-yard career mark. 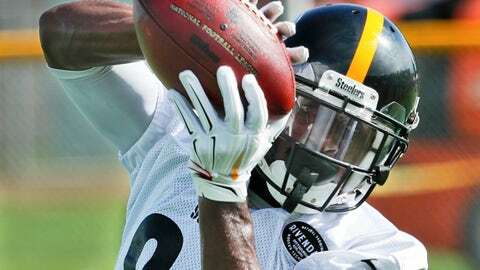 Brown maintained Friday that his relationship with Roethlisberger is strong. Roethlisberger and Brown have connected on 723 completions, good for the fourth-most in NFL history between a quarterback and wide receiver. Their 62 touchdowns are the most in franchise history, and one score Sunday will tie Roethlisberger and Brown for No. 10 all-time with Johnny Unitas and Raymond Berry. Roethlisberger, who currently ranks second in the league with 1,414 passing yards, blamed himself for Brown’s slow start. “I think I just have to play better to help him get his numbers, which would help us get wins,” Roethlisberger said. Last week against Baltimore, Brown caught five passes for 62 yards and a touchdown on 11 targets. He was targeted five times in the second half, but caught one pass for five yards as Pittsburgh managed just 47 yards of offense after halftime during a 26-14 loss. Brown believes a win against the Falcons can cure the Steelers’ woes. Steelers’ coach Mike Tomlin expects Roethlisberger and Brown to rebound. NOTES: S Morgan Burnett (groin), LB Vince Williams (hamstring) and WR Darrius Heyward-Bey (ankle) are all listed as doubtful for Sunday’s game against Atlanta. Burnett would miss his third straight game. Williams’ streak of 83 consecutive regular-season games played — fourth-longest among active NFL linebackers — is expected to end. CB Mike Hilton is expected to return after missing the Ravens game with an elbow injury.